Matt spent his time in Recife, Salgueiro and the community of Conceição das Criolas to develop a short film on the partnership between International Service (IS) Brazil and AQCC. The purpose of the film was to increase awareness in the UK of the positive effects of IS Brazil development work. In a month, Matt was expected to create a film that would introduce the quilombo community, the way of living of quilombola people and their fights for rights. As well, he was expected to talk about the work and the impact of IS Brazil in the community, through IS’ placement of a Mozambican agronomist and development worker. A lot to get your head around in a month, and a lot to cover in a short film. However, Matt accepted the challenge with grace and arrived in Brazil with an open mind, lots of energy, and a desire to reach all of the objectives agreed upon. 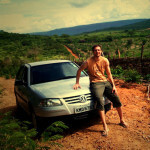 It was never easy, and certainly not a smooth ride, but Matt persevered and his time in Brazil was an incredible success. He made a huge impact on all of the people he worked with, created what will be an amazing film, and learned loads about himself and his profession along the way. If you’re interested in knowing more about his experience, the quilombo and IS, click on the case studies and/or blog links.